Hampton Roads is home to a growing Filipino population estimated at 40,000. Largely due to the U.S. Navy, Virginia Beach has the largest concentration of Filipinos on the east coast and is also the largest Asian minority group in the area. Pinoy Productions was founded in 2003 by independent television producer, Jay Sanchez and created to produce thoughtful and relevant, community-related programming. Sanchez has worked on a variety of projects at the regional and national level for over 17 years. Sanchez graduated from West Virginia University with a degree in Broadcast Journalism. Including WHRO, Sanchez has worked for (3) PBS affiliates in West Virginia and Pennsylvania. Previously, Sanchez was a producer/director for PBS affiliate WITF in Harrisburg, PA. Recent projects include: “In Our Aunties’ Words” for the Filipino American National Historical Society of Hampton Roads. The program was shown at the ODU film festival and broadcast on WHRO. Featuring Original Music by Singer/Songwriter Lisa Hunter, based on the oral history interview of Presentacion Igay. Oral History Poem by Emily P. Lawsin, based on the oral history interviews of Rosalina Regala and Isabel Galura. Actors in this Excerpt: Rica de Ocampo, Garri Madera, Lesly Burgamy Sauceda, based on the oral history interviews of Isabel Galura. Video Edited by Rica de Ocampo. The Filipino American Oral History Project of Michigan is a collective effort between University of Michigan faculty, students, staff, alumni, and community members. Our project aims to document the history of Pinays—Filipino American women—and Pinoys—Filipino American men, with a special focus on those who migrated and settled in the Midwestern United States. Through team-taught, service-learning courses, students have collected hundreds of photographs, life histories, and artifacts since the project’s inception in 2001. In 2002, we published the first book on Asian Americans of Detroit, titled Filipino Women in Detroit, 1945-1955: Oral Histories from the Filipino American Oral History Project of Michigan. Students and project volunteers also traveled to different conferences and campuses around the country, stressing to others the importance of documenting our histories. We launched the Pin@y Performance Project project in 2003, as one historian has put it, “To take oral histories out of the archives and onto the stage!” Through 15-minute, 30-minute, and 60-minute multi-media performances, a diverse all-volunteer cast dramatizes stories, poems, memoirs, photographs, and interviews of Filipinos in Michigan. In 2004-2006, performances featured students, ages 12-80, from the intergenerational Filipino American History class taught on Sundays at Paaralang Pilipino/PACCM. University of Michigan and Community Partners include: Filipino American National Historical Society (FANHS), Bentley Historical Library, Lisa Hunter, Ma’arte Tribe Artists Collective, United Asian American Organizations, Philippine Study Group Association (PSG), the Filipino American Students Association (FASA), Philippine Historical Society, Filipino Women’s Club of Detroit, Paaralang Pilipino Language & Culture School, and Philippine American Community Center of Michigan (PACCM). Funding provided by University of Michigan Arts of Citizenship Program; Center for Research, Learning, and Teaching; Edward Ginsberg Center for Community Service and Learning; Asian/Pacific Islander American Studies; Department of American Culture; Undergraduate Research Opportunity Program, and Department of Women’s Studies. I didn’t know Aisa was using so much of me and my “No More Moments of Silence” poem, but here you go (an aerial view by the FYI yoots). Salamat. 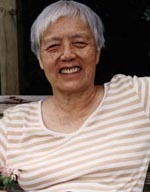 Grace Lee Boggs is an activist, writer and speaker whose 60 years of political involvement encompasses the major U.S. social movements of the 20th century — labor, civil rights, Black power, Asian American, women’s and environmental justice. A daughter of Chinese immigrants, she was born in Providence, Rhode Island in 1915. In 1953, she came to Detroit where she married James Boggs, labor activist, writer and strategist. Working together in grassroots groups and projects, they were partners for over 40 years until James Boggs’ death in July 1993. The monthly review press published their book, Revolution and Evolution in the 20th Century, in 1974. In 1992, with James Boggs, Shea Howell and others, she founded Detroit Summer, a multicultural, intergenerational youth movement program, to rebuild, redefine and re-spirit Detroit from the ground up. She spreads her ideas by writing a weekly column in the Michigan Citizen newspaper. In 1998, the University of Minnesota Press published her autobiography, Living for Change. Among numerous honors, Grace has received the distinguished Alumna Award from Barnard College, the Chinese American Pioneers Award, from the Organization of Chinese Americans, and a lifetime achievement award from the Anti-Defamation League. A plaque in her honor is displayed at the National Women’s Hall of Fame in Seneca Falls, New York. Grace is one of the main reasons why we moved to Detroit. Here is an interview I was asked to do of Grace Lee Boggs for Global Feminisms: Comparative Case Studies of Women’s Activism and Scholarship, an international project funded by the Rackham Graduate School, with additional funding provided by the College of Literature, Science and the Arts, the Institute for Research on Women and Gender, the Women’s Studies Program, and the Center for South Asian Studies at the University of Michigan. Click on the link below, then scroll down for the full Video Stream, Transcripts, and DVD order information.